We are still buzzing from last night's Experimental Words show at Chicago Botanic Garden - five phenomenal sci-poetry performances in front of an electric crowd! More on that later, but for now Sam and I are poets-in-residence at the Unearth Science Festival. We're already led our first cut-up workshop, with participants writing botanical ballads about patchwork quilted memories, the sanctity of the garden, and getting lost in the sky. Lovely stuff. Speaking of the sky, we also took part in the Sky Day Project, tweeting out images of that big expanse above us. An awesome project, which aims to educate and promote greater understanding of our sky. Check out the rather grey (but still delightful) Chicago sky today! We have also planted a poe-tree, which is ready to be tagged with words. 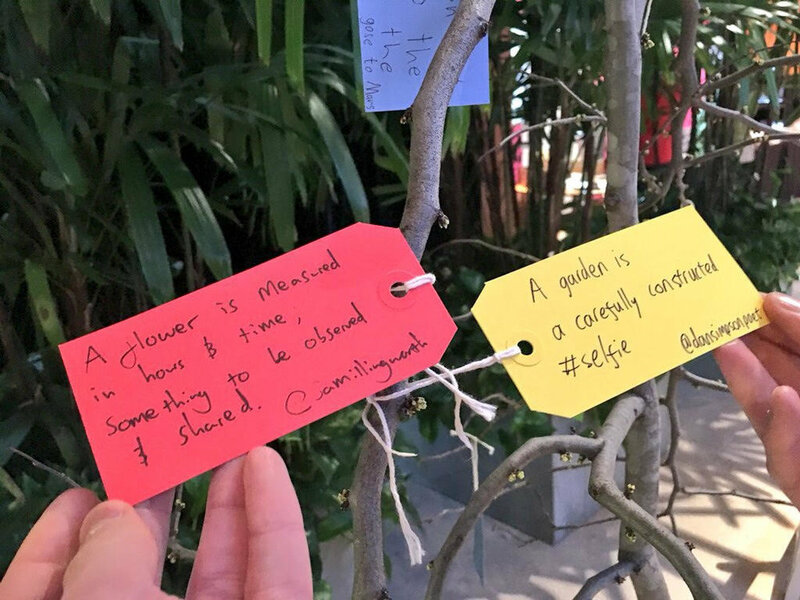 Poetry is blooming here at the Garden!